Ritual monsters are an old but surprisingly rare bunch in dueling. These powerful blue-backgrounded creatures typically require both a corresponding ritual spell and enough tribute monsters (from your hand or field) to equal or exceed the level of your desired warrior, but once they're out, they unleash a variety of powerful effects and wield impressive ATK scores. 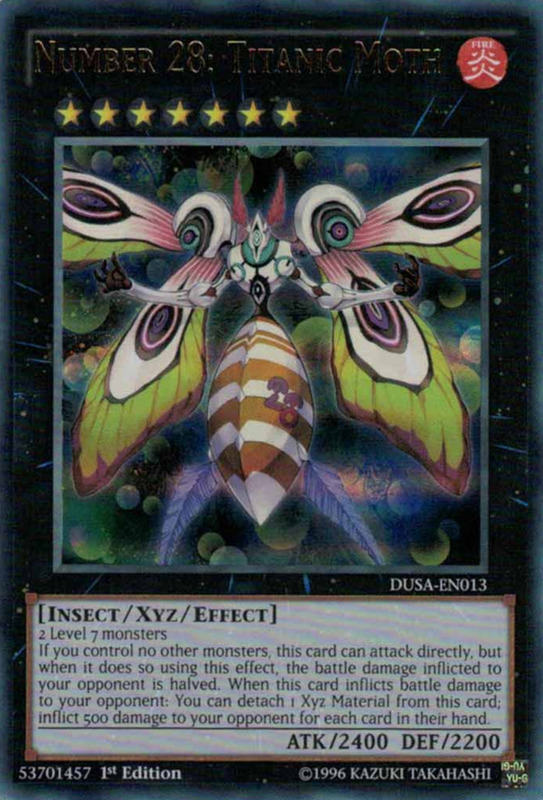 Plus, since they don't stem from your extra deck, they only take up main monster zones, leaving your limited extra deck zones for the titans that need them. But a ritual monster can only serve you as often as you get to summon it, and doing that requires tribute materials. However, rather than desperately throwing away your best cards to achieve the level requirement, use the numerous minions who grant bonus effects after or during ritual summons, further boosting the abilities of your ceremonial behemoths. But with thousands of monsters available, which materials offer the most power? These are the ten best ritual material monsters in Yu-Gi-Oh! I hate to include a cop-out non-specific answer, but it's true—a second copy of your desired ritual monster will of course share its own level. This lets it serve as the entire tribute, and is especially useful if you're using ritual spells like Gishki Aquamirror that demand the tributes exactly equal (and can't exceed) the level of the summoned monster. Placing a ritual monster in the graveyard can also help with other effects, like using Aquamirror to return Gishki Zielgigas to your hand. 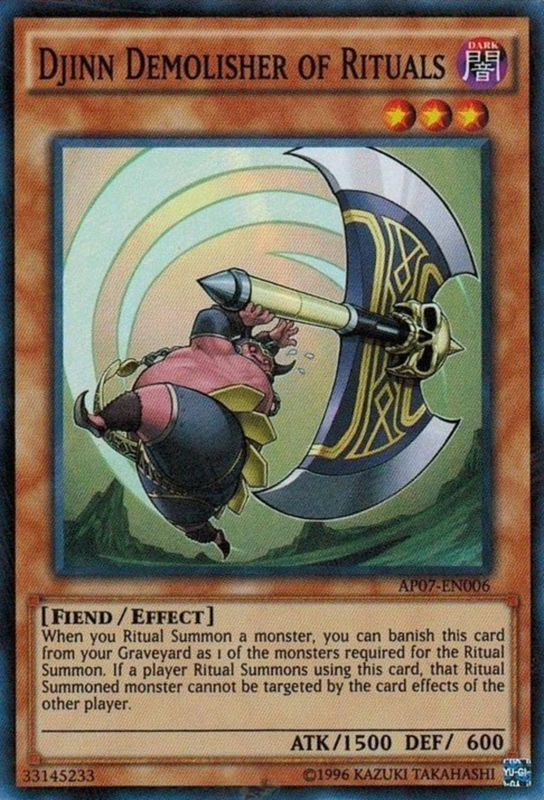 That said, a rule many players don't know is that ritual monsters can't be special summoned from the graveyard unless they were properly ritual summoned at first, so unfortunately you can't just discard and revive with Monster Reborn or other rejuvenations. 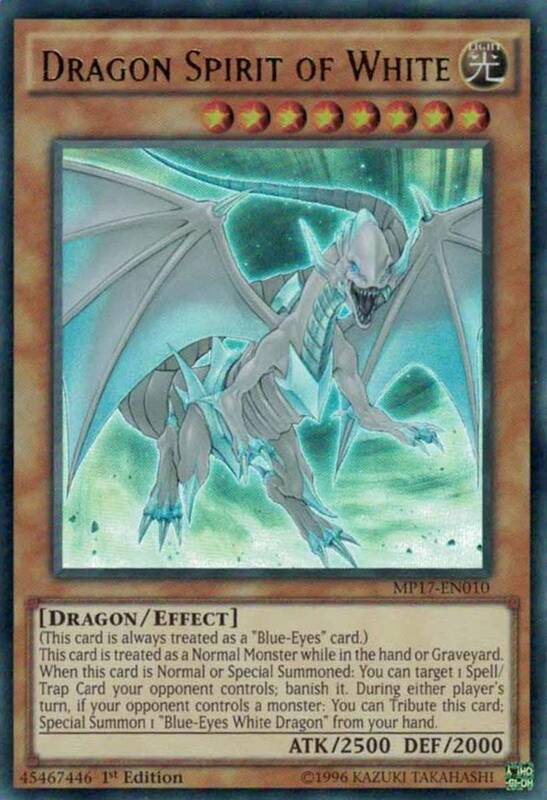 Duel Monsters contains a heap of impressive dark-attributed ritual beasts such as Blue-Eyes Chaos MAX Dragon and Demise, Supreme King of Armageddon. Luckily, even if you don't have a clone card in your hand when you're ready to ritual summon these fiends, you can instead use Ritual Raven. As a weak level 1, Raven would normally only provide one level for whatever your monster's quota is, but its awesome effect lets it serve as the entire tribute for any dark ritual monster. It's as simple at that; if you're crafting a dark deck list, throw some Ritual Ravens in to complete your ominous ceremony will minimal card loss. 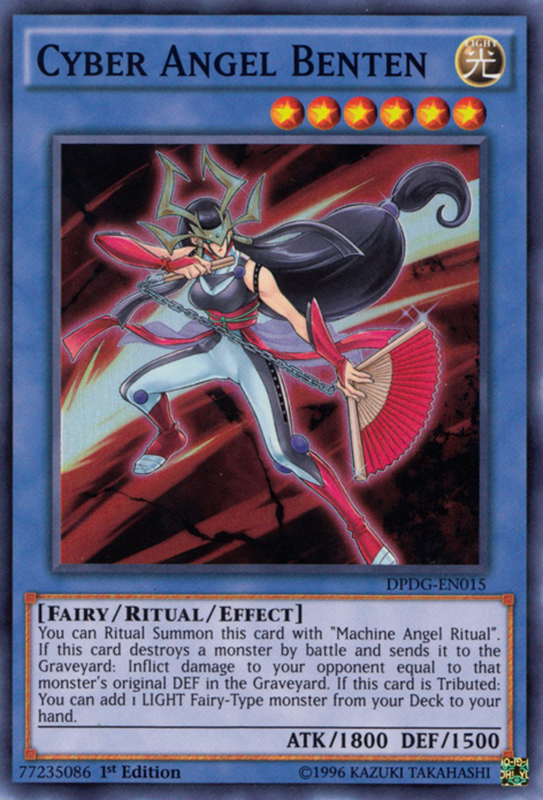 Not only is Benten part of the overpowered Cyber Angel archetype, she's a ritual monster herself and inflicts damage to your opponent whenever she destroys a monster in battle equal to its original DEF score (at least as long as it winds up in the graveyard). 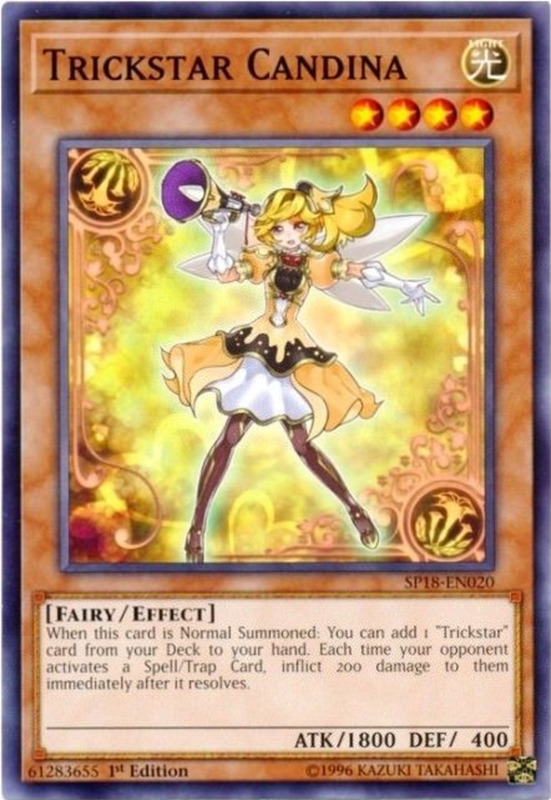 But we're not here for her field capabilities and burn damage; Cyber Angel Benten adds a light-attributed fairy-type monster from your deck to your hand when tributed. This not only matches her own elements, it activates when she's tributed for anything, from tribute summons to card effects to, as we're interested in, ritual summons. As a final gift, this trait doesn't bear the pesky "once per turn" errata, so you're free to tribute multiple Bentens and search out multiple cards in a single move. 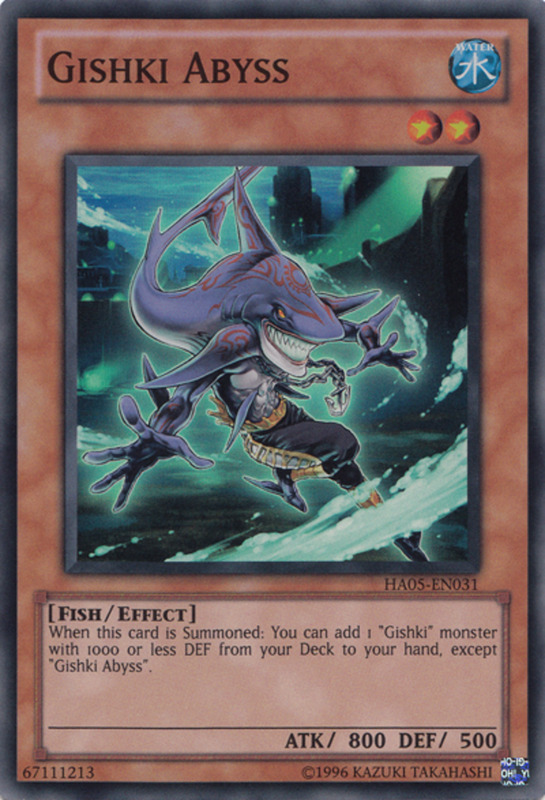 Undoubtedly one of the best Gishki supports available, Gishki Shadow works well even outside its archetype. You can discard it from your hand to add a Gishki ritual spell from your deck to your hand, and it can serve as the entire tribute for a water-attributed ritual monster. 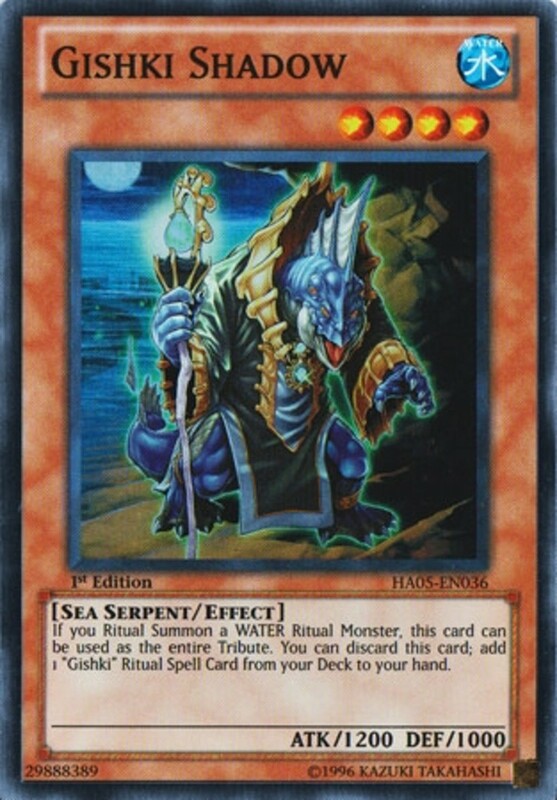 This not only includes its Gishki brethren but other water ritual gargantuans such as Nekroz of Trishula. Lethal in Gishki arrangements and useful even outside them, Gishki Shadow is basically water's version of Ritual Raven but with higher battle stats and extra benefits within its own family. The Djinn cards are an entire series of dark fiends designed to provide extra abilities to the ritual monsters they help summon. Djinn Prognosticator of Rituals is only level 3 and bears weak combat abilities, but any monster ritual summoned using it as material forces your opponent to discard a card whenever the ritual monster inflicts battle damage to them! This helpfully includes both direct attack damage and shave/pierce damage from striking a weaker monster. Unfortunately, your opponent gets to pick which card they discard, but it's still a superb and uncommon opposing hand depletion trait. Finally, like his kin, you can banish Prognosticator from your graveyard as one of the tributes for a ritual summon, yet again accessing his levels and forced-discard ability. Presider of Rituals is one of the better Djinn since he wields a respectable (for his level) ATK of 1800 and contributes an entire four levels to your monster's demand. 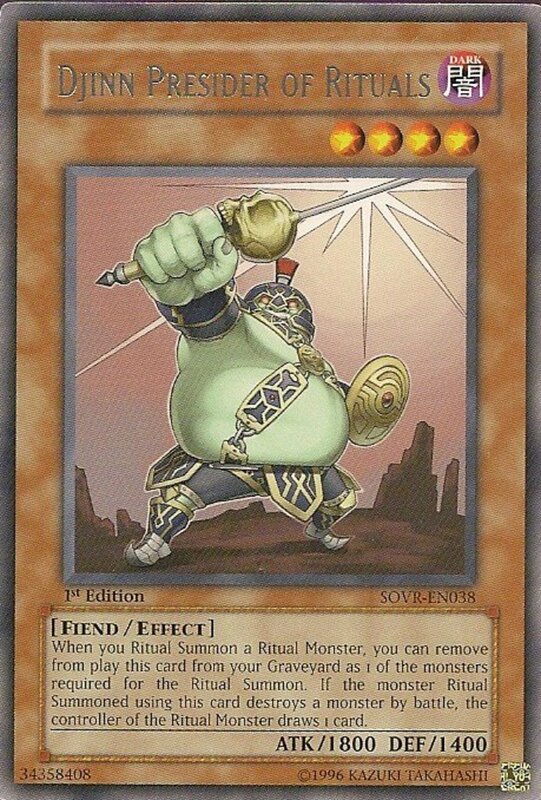 Even better, when a ritual monster is summoned using Presider as material, whenever it destroys an opponent's monster in battle, the ritual monster's controller (which is hopefully still you) gets to draw a card, helping counteract the heavy hand-depletion of ritual summons. Like our last entry, you can banish Presider from your graveyard as one of the materials for a ritual summon, once again adding four levels to your net amount and boosting your ally with the card-drawing effect. While forced discards are more valued than extra draws, Presider's superior stats, level, and ability to function even if your opponent has an empty hand lend him the advantage over his counterpart. Veteran duelists know where I'm going with this. Of course, Metal Reflect Slime is a trap, not a monster, and as such can't be used as tribute—until activated. At that point, Metal Reflect becomes a sturdy 3000 DEF wall. With 0 ATK and an effect that disables attacking, he's useless offensively, but guards against everything except the absolute strongest of monsters. 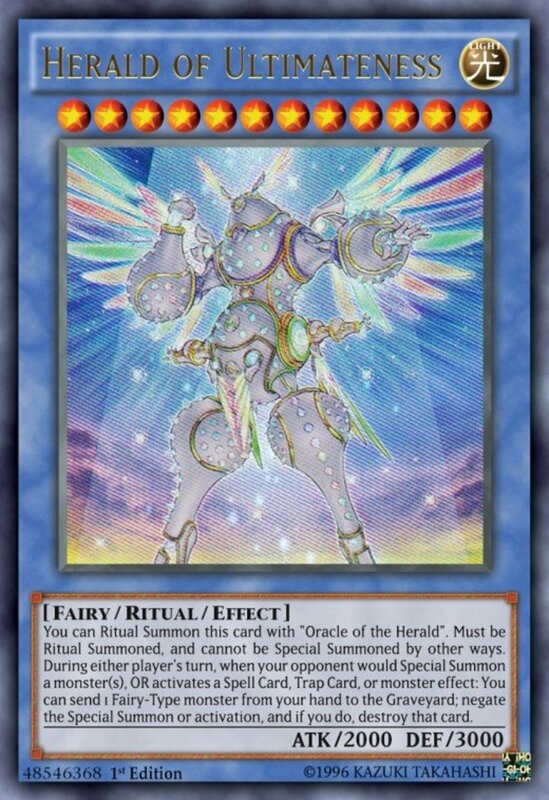 After that, his high level of 10 works great for either rank 10 xyz summons or for serving as the entire tribute for most ritual monsters. A level 10 tribute will alone satisfy the requirements of almost every ritual card, and unlike many prime materials who simply wait in the hand until spent, Metal Reflect Slime defends you until spent. 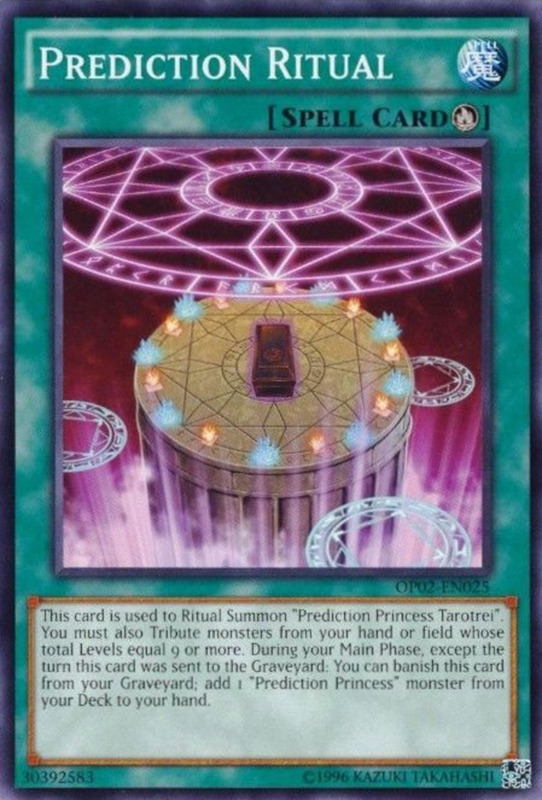 In other words, even if you're not yet ready to ritual summon, it'll still serve you by guarding your life points, and as a trap, you can activate it at quick-play speed on any phase. Like Prognosticator, Demolisher is a level 3 Djinn, but this genie wields a more-respectable 1500 ATK, actually allowing him to inflict some decent direct damage.. 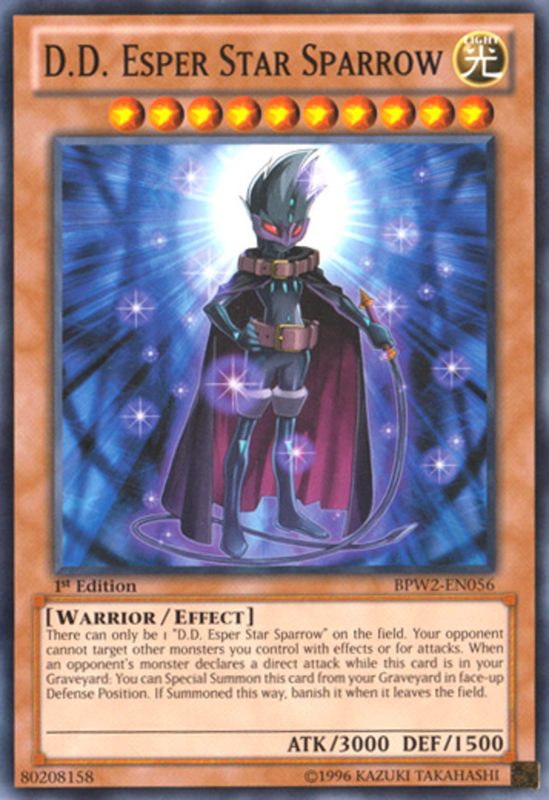 However, he really impresses with the boon he grants any ritual monster that uses him as material: it can't be targeted by your opponent's card effects. 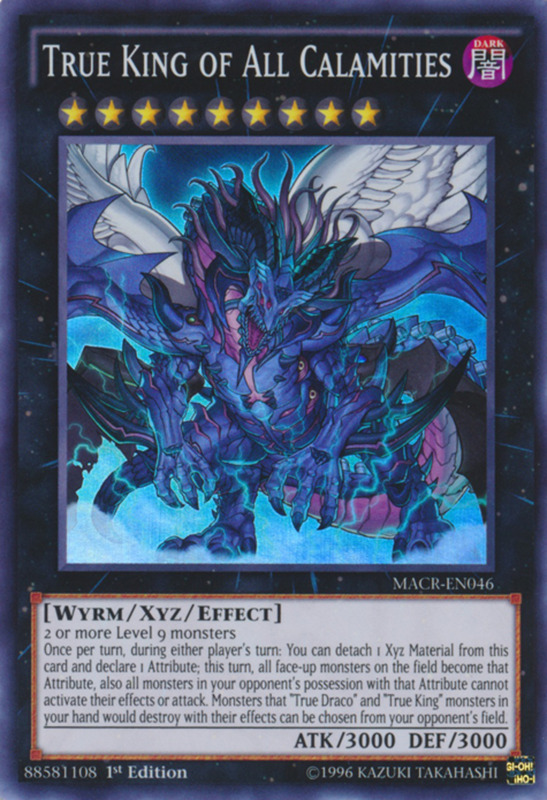 This awesome barrier defends against all but rare non-targeting removals (like Raigeki and Mirror Force) to keep your strongest monster long enough to actually win with its abilities. 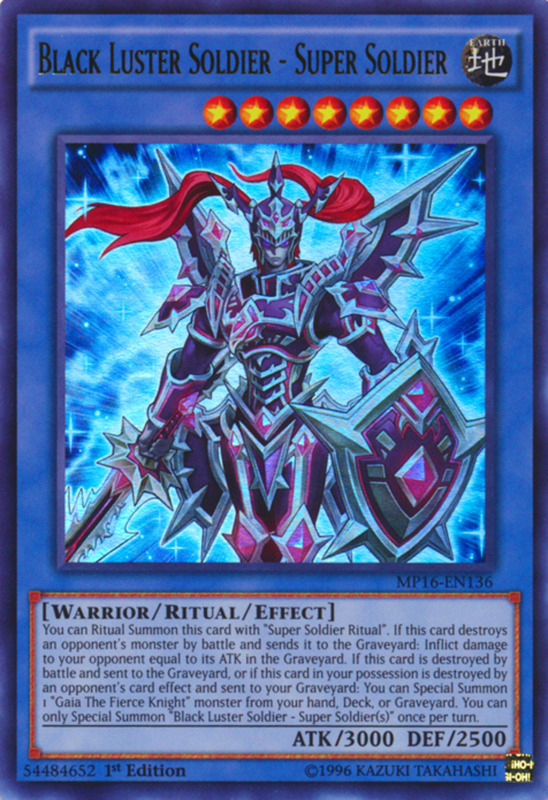 Just like his kin, you can banish Demolisher from your graveyard to again let him count as a tribute for a ritual summon, once again shielding your precious blue knights. 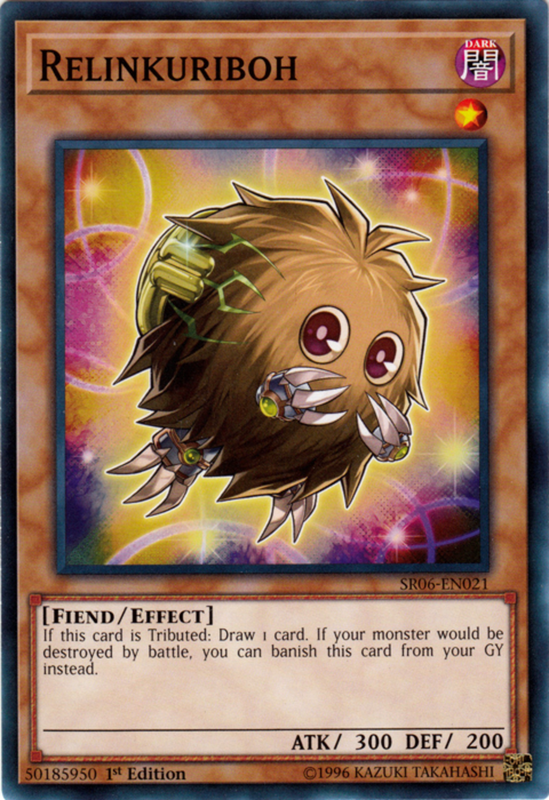 Yu-Gi-Oh's original mascot monster Kuriboh inspired its own archetype of utility monsters, one of the best being Relinkuriboh. 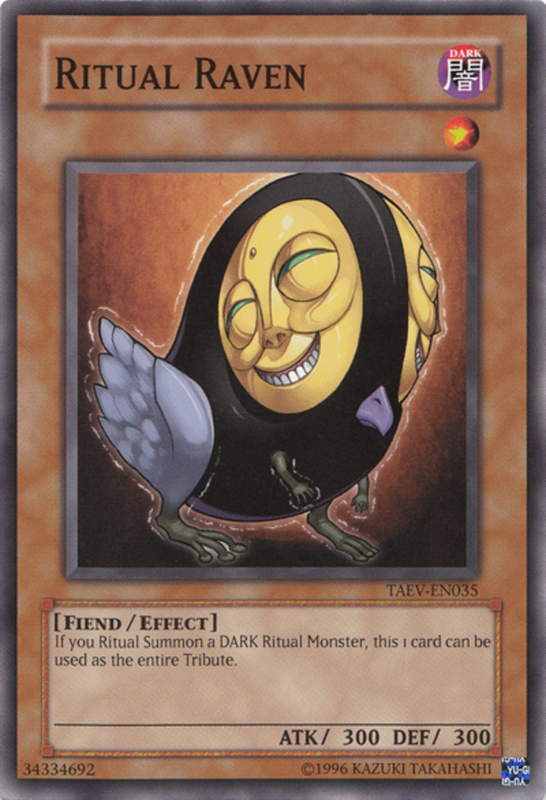 When tributed (whether for a tribute summon, ritual summon, or card effect), Relinkuriboh lets you draw a card, perfect for replenishing your hand after a costly ritual summon. Admittedly, he'll only add one level to your needed total, but remember that can make all the difference. After that, you can banish Relinkuriboh from your graveyard to prevent the battle destruction of any monster you control, defending not only your ritual titans but any monster you possess from combat removal. Only one copy of this imposing warrior-type champion can exist on the field at once, meaning if your opponent controls one, you can't summon your own until their Star Sparrow is removed, and vice versa. On the field, Star Sparrow prevents your opponent from targeting other monsters you control for both battles and effects, an awesome barricade that lets you swarm your weaker utility creatures. He's also packing a daunting 3000 ATK to match even a Blue-Eyes White Dragon in battle. Star Sparrow works well as both an ace monster and as ritual fodder. 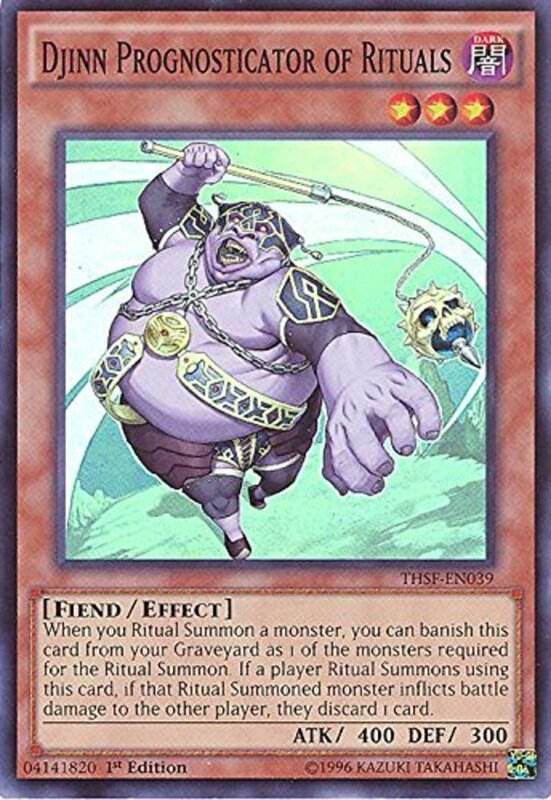 With his level 10, he can alone satisfy the summon conditions of most ritual monsters, and tributing him for this purposes places him exactly where you want—into your graveyard. 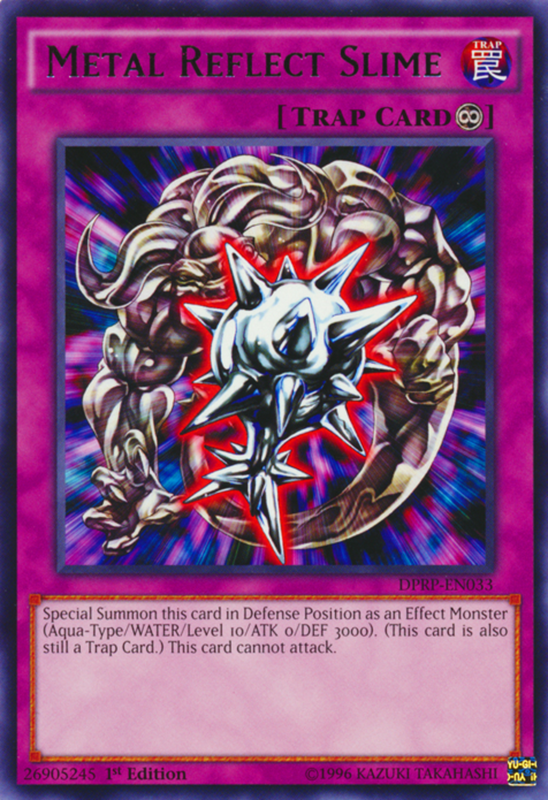 After all, when your opponent declares a direct attack, you can special summon him from the discard pile in defense position, blocking the hit (and surviving if their ATK is 1500 or less). Use Star Sparrow to field the vast majority of ritual monsters with one tribute while simultaneously preparing your graveyard for a last-resort defense. Unlike many boss monsters, you're also able to revive Star Sparrow with other effects like Call of the Haunted or Monster Reborn, making it even more beneficial to bury him as soon as possible. A must-have for any warrior or ritual build I craft, Star Sparrow is a versatile unit well-suited for a variety of roles, and I'm amazed that you can buy this potent card for less than a dollar! Those a comparatively scarce lot, ritual monsters remain a competitive and versatile bunch who transitioned well through the link monster era. Use cards like Preparation of Rites and Menju of the Ten Thousand Hands to search them and their spells outs as soon as possible to assault your adversary before they're prepared. 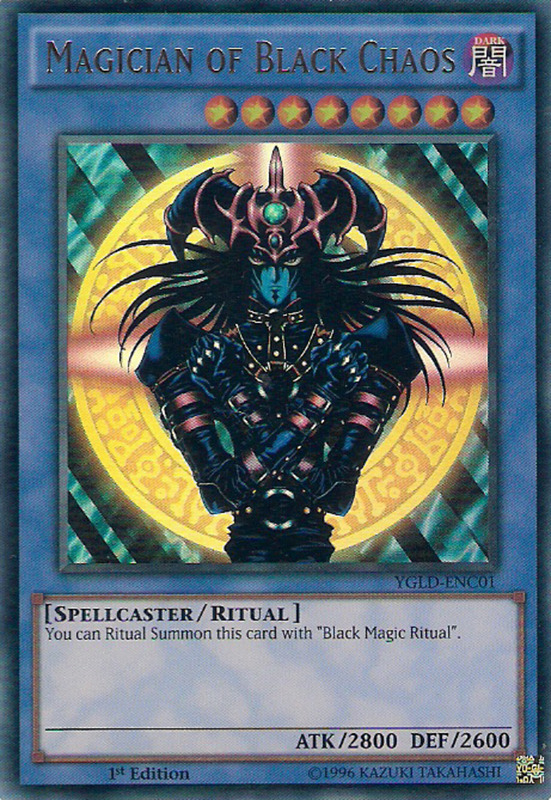 With many impressive materials left uncovered (some Djinn monsters were excluded for currently being banned), we'll undoubtedly return to unmask more great ritual support cards. But for now, as we eagerly await Konami's next set of ritual monsters and tribute-activating materials, vote for your favorite card and I'll see you at your next Yu-Gi-Oh countdown!